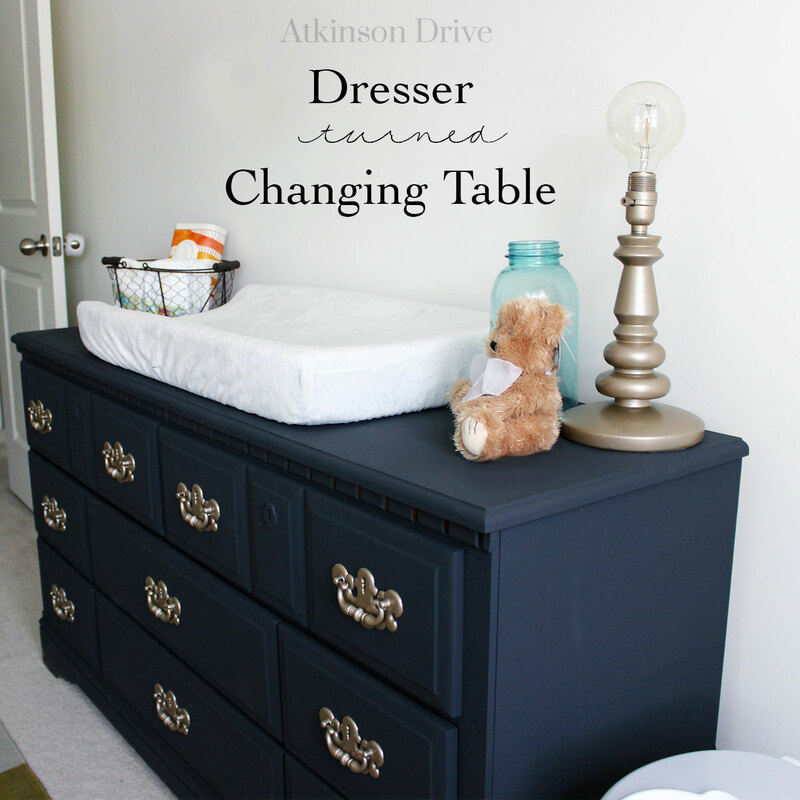 We still had a changing table from when my oldest was a baby, but we had enough space in the nursery for a larger piece of furniture – and you can never go wrong with extra storage! So, as soon as we found out we were having a boy, I started perusing Craigslist for an affordable and sturdy wooden dresser that I could turn into a changing space. I found this beauty (with a hutch/mirror on top) for $25!!! I mean…seriously…what a steal. I have a hard time containing my excitement about it. It’s in really great shape, so all I had to do was remove the knobs and drawers and get to painting. Of course I used my go-to Annie Sloan Chalk Paint so I could forgo sanding. To clean the drawer pulls, I soaked them in a mixture of vinegar and water for a few hours to get rid of all the grime. Once they dried I simply sprayed them with a few thin coats of Krylon Brushed Metallic paint in Caramel Latte. The dresser is so functional…I’m not really sure how I survived without one before! 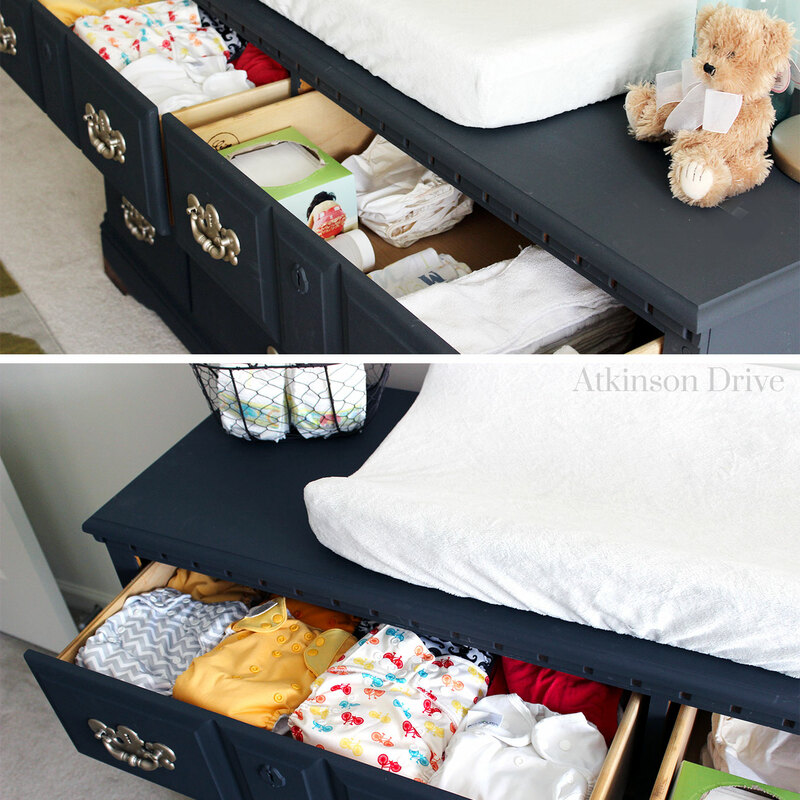 The top drawers hold my cloth diaper stash and all of the extra “accessories” needed for cloth diapering: disposable covers, diaper pail freshener, cloth wipes, and extra inserts. The other drawers hold clothes, swaddle blankets, sheets, sleepers, etc. Since it’s so much more difficult to cloth diaper newborns, we are using disposables for these first few weeks. 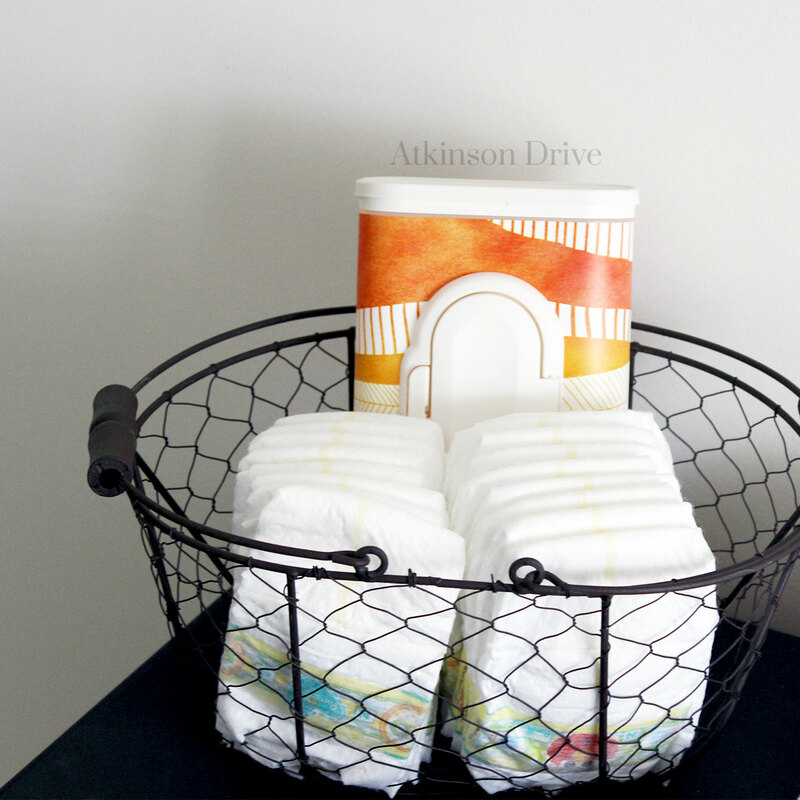 I found this adorable basket on Pick Your Plum for a great deal, and it’s perfect for keeping changing necessities within reach! 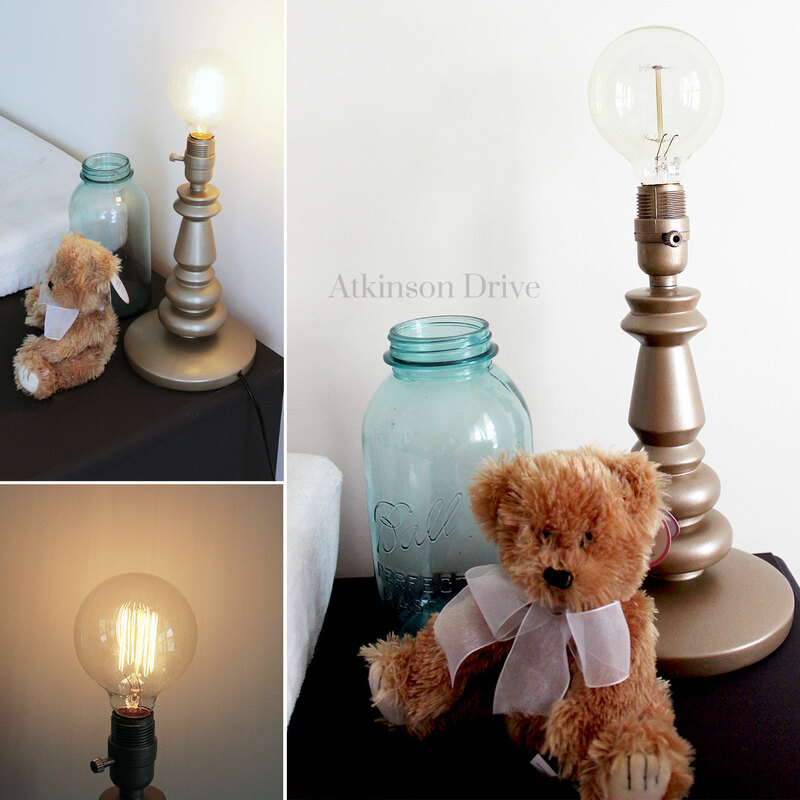 This lamp is another super affordable, and adorable project that I’m loving for this space. The base was in my oldest son’s room for a long time. It just wasn’t going with the new theme for his room, and I was planning on getting rid of it…but it kills me to give away something that’s still functional and in good shape. So, I removed the shade and taped off all the important pieces that I didn’t want to have covered in paint. Then I sprayed it with a few coats of the same Krylon paint that I used on the drawer pulls. It got a nice top off with an Edison bulb, and voila…a simple, stylish project that gives us just enough light when we need it! Check out more of the Rustic Nursery! I stopped over from The Makers linky party! Great job! I love the color! Love this! The color is awesome and great tip about soaking off the grime in Vinegar. Thanks for sharing at The Makers! That is an incredible dresser, I love that the insides are wood and note particle board! I love old furniture! Annie Sloan is the way to go! Good job making it ever so pretty. I won’t ever paint another piece of furniture with anything else!!! I wish we would have cloth diapered, it would have saved to much money in the long run. Oh well, I guess you live and learn!